Finishing a marathon or completing a challenging alpine hike is a landmark achievement for most of us. But according to expert coaches, dreaming about your finish isn’t nearly as important as planning your start. And the right start is a realistic and flexible training plan. Hill coaches runners by phone and online through HillRunner.com, where his online tools help runners analyze their training progress. Seattle outdoor coach Courtenay Schurman reinforces the message of making a plan and sticking to it. She’s the author of “The Outdoor Athlete,” and her Seattle company, Body Results, trains people for outdoor activities from running and river rafting to summiting Mount Everest. For Schurman, an essential training formula is tackling an additional 10 percent of the goal each week. “If you want to hike 30 miles, and you’re starting at five, the second week you’d hike eight miles,” she says. So if you’re aiming to hike steep trails, start with perhaps 1,200 feet of gain (she recommends the hike at Little Si, in the North Bend area) and move on to nearby Rattlesnake Ridge (1,400 feet) the next week. Gillian Gagne, senior account manager at Amica Insurance in Seattle, ran the Amica Insurance Seattle Marathon in 2017. She started training the previous July and began running four to five miles per day, with a day or two of cross training each week, as well as a rest day. 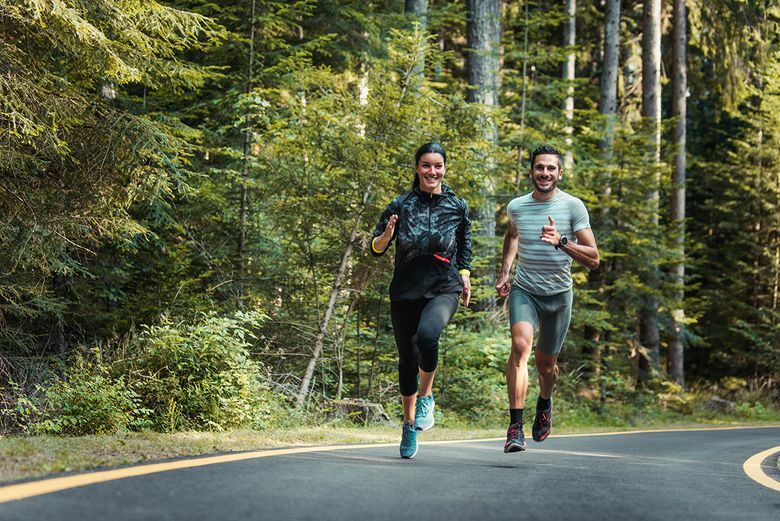 Once she felt comfortable with her base level of training, she added a “long run” day to each week, increasing each week in one-mile increments until she hit 20 miles. Then she tapered down in the weeks leading up to the marathon. She notes that starting a training program is a good opportunity to re-evaluate what you eat — your fuel. “When possible, eat organic and eat colorful food,” she says. Even the most well-structured training plan can be affected by the unexpected: illness, injury, or family or work crises. Training with a partner or a group is a sure-fire way to encourage yourself to stick with your plan. Seattle offers several running groups (including those listed on the Amica Insurance Seattle Marathon website). Seattle-area hikers can find group hikes at all levels of experience through The Mountaineers. “Running with other people made a night-and-day difference for me,” says Grace Martinez, who founded PNW Ladies Running Group three years ago. Martinez struggled through a marathon 10 years ago. This year she’s on track to compete in Chicago and Seattle after doing Seattle’s half marathon in 2017. Will Maloney, account manager at Amica Insurance in Seattle, ran the Amica Insurance Seattle Marathon in 2017. Finding a training routine that worked for all areas of his life was a challenge. “Training while working a full-time job and being able to have time for non-work/running activities” was a balancing act, he says. Training with a friend was helpful, he adds, as they held each other accountable. Amica Insurance is proud to support the Seattle community on Nov. 25 as the title sponsor of the Amica Insurance Seattle Marathon for the 11th straight year. Amica Insurance offers outstanding service and coverage you can count on.